After a one and a half year trial run, project planners have declared that the free use of Apple iPads for travelers at airports is a good idea. 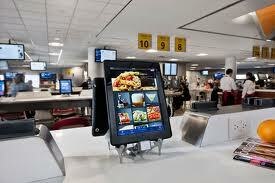 OTG Management, a company that manages restaurants and newsstands at a large number of key airports introduced free iPad use at LaGuardia Airport last winter, and now that they see that their idea is a good one, they are revving up to bring about 7,000 of these internet enabled devices into three additional major airports: JFK in New York; Minneapolis-St.Paul in Minnesota; and Pearson airport in Toronto. OTG even won a FAB Award (Best Food and Beverage related innovaton) for 2012 for this idea. Having the iPad right next to your gate makes purchasing so easy and convenient, there is no longer any excuse not to buy something while waiting for your flight. Travelers can check to see if their flight is ready to leave or they can check their email, play games, watch videos, or just about anything else that can be done on an iPad that is loaded with the right apps. OTG says they will constantly be adding new apps as they make deals for them. Travelers that are worried about leaving important account information and passwords behind when they run for their flight need not be concerned. As soon as the iPad is sent back to home, all personal information is wiped clean. “All you have to do is hit the home button, run for your flight and we’ve got you covered. If you forget to hit the home button, in two minutes the screen saver will come on and wipe your information there” says Lee. Making the iPads available is also useful to people that come to the airport with their own device. One traveler commented that the free-use iPad is connected to the internet, whereas hers is not. Another traveler was simply happy that he did not have to find his device deep down within the closed confines of his luggage. The installation of the additional 7,000 devices should be completed within the next 18 months. The next stage in the program will be to expand into more airports around the country.